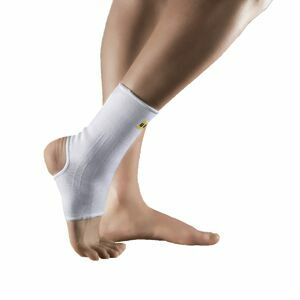 # 35ELASTIC ANKLE BRACEDescription: This brace accompanied with a strap support provides mild protection for the ankle as well as increases proprioception and therefore joint stability. Indications: Used to reduce swelling and provide stability following ankle sprains and tendonopathies. Fitting Instructions: Easily applied, open heel sleeve, fits as a sock. Suitable for left or right leg.